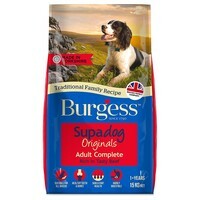 Burgess Supadog Originals Adult Complete Dog Food (Beef) is a nutritionally complete diet made with moist, beefy chunks in real meat juices. Naturally rich in protein for good muscle development and maintenance, the food also contains natural antioxidants to support the immune system. Great quality dog food and lower in protein that other leading brands which is something I look for in dog food. Different sized tasty chunks which my dog loves. Would recommend.